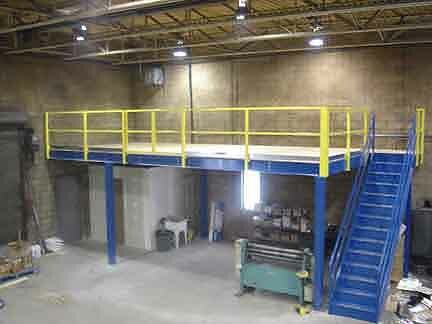 Prefabricated Mezzanines and Services from Panel Built, Inc. Looking for prefabricated, free standing mezzanines for your workplace with superior workmanship at rock bottom prices? Panel Built is your go-to manufacturer of all manner of industrial-purpose mezzanines and platforms, offering the absolute best bang for your buck. Take hold of the benefits of everything Panel Built has to offer—don’t put off ordering a prefab mezzanine from Panel Built! Steel mezzanines prefabricated by Panel Built are beneficial and serve many necessary purposes, thanks in part due to their unique construction process and flexibility in design. 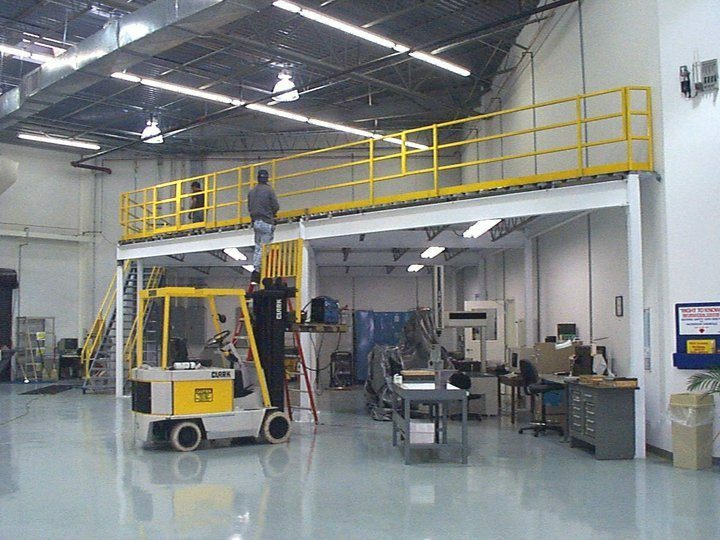 These heavy-duty industrial platform structures can be used for storage, supervisory inplant offices, conveyor integration, operating space, or as a simple platform for standing or walking. Rugged and able to support large loads, these steel mezzanines can be custom designed to fulfill almost any space requirements and may incorporate any of a variety of decking materials picked by the customer. Founded in 1995, Panel Built is one of the leading companies for prefabricated structures and buildings in the U.S. Dedicated to complete customer satisfaction, Panel Built works tirelessly to provide quality, flexibility, excellent workmanship, and the best customer service on the market. Knowing that consumers need convenience and minimal disruption to their business but still expect amazing quality and reliable products is a no-brainer to the folks at Panel Built. Whatever your needs or desires are, you cannot go wrong with cold-rolled mezzanines or any of the other excellent products offered by Panel Built. Structural mezzanines aren’t the only product offered by Panel Built—here are some of the many other top-quality structures available for purchase. Modular office buildings—Convenient, safe, and durable, these expertly engineered offices are excellent for use in warehouses, manufacturing environments, and many other places of work and business. A Panel Built modular office (or mezzanine offices) also includes choice of materials, excellent energy efficiency, and a wide variety of different sizes available, including the standard 8’x10’ structure. Prefabricated exterior buildings—With limitless uses, prefabricated exterior buildings are a fantastic alternative to traditional construction due to their flexibility, low cost, and high-quality manufacturing process. Because these pre-built structures are made in a factory rather than on location, they are cleaner, better built, more efficient, and quicker to construct in a way that results in less hassle and less interruption during installation. Pre-assembled buildings—With all the benefits of prefabricated structures and more, pre-assembled buildings can be transferred to their intended location via forklift and allow for simple, immediate installation. Stair and ladder systems—Sturdy and reliable stair systems, ladders, and railing components are in compliance with OSHA, IBC, UBC, and BOCA codes, engineered specifically for their long-lasting usability. From solid steel construction to flawless powder coat finishes, these structures are strong and long lasting. Safety barriers and guardrails—Steel single or double rails are available and created to withstand high impacts, offering ways to make any environment safer. Flexible and sound, these structures are also available in a new lift-out system that allows for easier installation and an improved look for the final result. Custom projects designed to fit client needs—Including modular offices, guardhouses, security booths, tollbooths, storage, turnstiles, and many, many more, there are endless ways to customize a project for your specific needs with Panel Built. Whether you know exactly what you want or need recommendations based on your own needs, Panel Built is here to offer their expertise and tireless customer service to build the right structure for you.